Well, I guess I am not finished with the census just yet. I found Isaac once again in Pomfret and I finally discovered census records for a Dr. Lee-o-Netto which I will present in the next couple of posts. 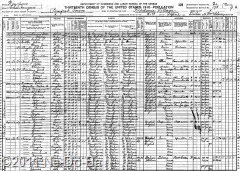 1910 U.S. Census for Pomfret, Chautauqua Co., NY, page 9a, dated 21-Apr-1910. Isaac Kanistanaux, head, male, white, 51, 3rd marriage, married 7 years, he and both parents born “In Canada”, immigrated in 1860, alien, he reads, writes, & speaks English, farm laborer, renting his home. Anna Kanistanaux, wife, female, white, age 55, 2nd marriage, married 7 years, given birth to 10 children with 7 still living, she and both parents born in English Canada, immigrated in 1864, she speaks, reads, & writes English. This is the same man that was found here in 1905 and I am reasonably sure he is the child called Henry in the Layton & Marleah Kanistanaux family in the 1870s & 1880s. I note with interest he is listed as white, yet it appears the census taker originally referred to his place of birth as perhaps In(dian) Canada, but then crossed out the “In”. He says this is his 3rd marriage and his current marriage to Anna has lasted 7 years. This suggests that Anna and Belle (his wife in 1905, just 5 years prior) are the same person. If this is correct, than there is a wife before Christina (his wife in the 1892 State Census) or between Christina and Anna Belle. Perhaps marriage records can be located to clarify this.